Four Corners Ethiopian Church Launches! I’ve had the joy of celebrating two births recently – our grandson and the Four Corners Ethiopian Evangelical Church (FCEEC). Just like my daughter and her husband prepared for the birth of their son, Endalk and Betty Ayo have been preparing for the birth of their new church. We all know that preparation and strenuous labor is required to give birth to a child. The same is true when birthing a church. Endalk and Betty have been praying, casting vision, raising funds, recruiting their initial core team, and renovating a rented church facility. They also started several small groups to set the DNA for grassroots outreach and discipleship. On top of the rigorous demands of starting a church, both of Endalk’s parents passed away this past year, which required three unexpected trips back to Ethiopia. We grieved with him, yet thanked God for his sustaining grace to Endalk, Betty, and their children as they prepared to launch their new church. I will spare you the pictures of my first grandchild, though hard, as a proud grandfather. 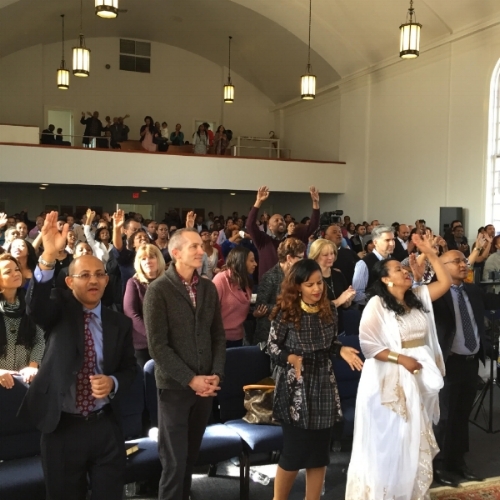 However, check out a couple of pictures below and a quick 15 second video of the passionate worship at last Sunday’s launch of Four Corners Ethiopian Evangelical Church in Silver Spring, MD. Wow! God is on the move advancing his kingdom through church planting. Thank you for investing in your missionary and SENT’s general fund. God is using your partnership with us to advance the gospel in more neighborhoods, subcultures, and cities!